Measuring cups come in a variety of colors and materials but the measurements are always standard. A glass measuring mug makes it easy to measure liquid ingredients. Some liquid measuring cups are considerably larger than dry ones. Measuring cups are used in cooking to measure accurate portion sizes of liquid and dry ingredients in recipes. Most are made from metal, glass, or plastic and use the standard 8 ounce (236.5 ml) "cup" as the basic unit of measurement. If measurements are made in US or imperial measurements (cups, teaspoons, etc. ), then it is important to use the proper cups when dealing with both dry and liquid ingredient lists. A cup of flour is not measured in the same way as a cup of vegetable oil is, so cooks usually keep two sets on hand. Dry measurements are usually made in plastic or metal containers, while liquids may be measured in transparent glass or plastic cups. 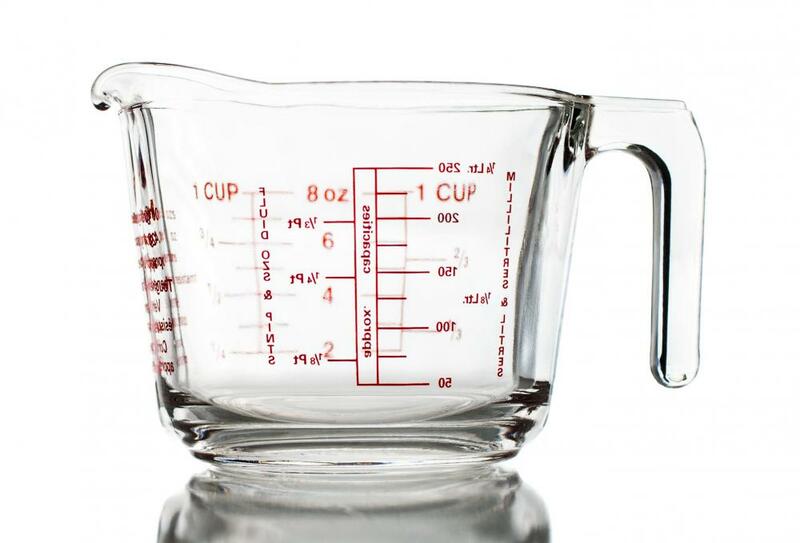 One important thing to keep in mind when using measuring cups is to use the size closest to the recipe's requirements. A typical set marks off many gradations, starting with a 1/8 cup measurement (similar to a tablespoon) and working through the common fractions found in recipes: 1/4, 1/3, 1/2, and finally 1 full cup. Any other proportions can be made through a combination of these cup sizes. Liquid measuring cups may be much larger than dry ones, starting with a 1 cup size and working up to nearly a gallon (30.2 l) in some sets. Individual cup sizes may be marked through visible lines imprinted on the sides of a large capacity measuring cup. Cooks should note that, in most US recipes, dry measurements are made by volume rather than by mass. This can be confusing to people who are used to measuring ingredients in metric, since 1 cup of flour does not have the same mass as 1 cup of granulated sugar — this volume of flour weighs 120 grams, while a cup of sugar weighs 200 grams. Many cookbooks and online recipe sites provide conversions for most common ingredients. Recipe measurements usually include important information about which measuring cups to use and how the ingredients should be packed in them. Unlike teaspoon measurements, which may include words like "rounded" or "heaping," dry ingredients are assumed to be level. Some ingredients, such as brown sugar, may have to be packed tightly for accurate measure, while others, such as flour, may need to be sifted for a lighter volume. Liquid measuring cups assume the level of the liquid reaches the desired line at the cook's eye level. 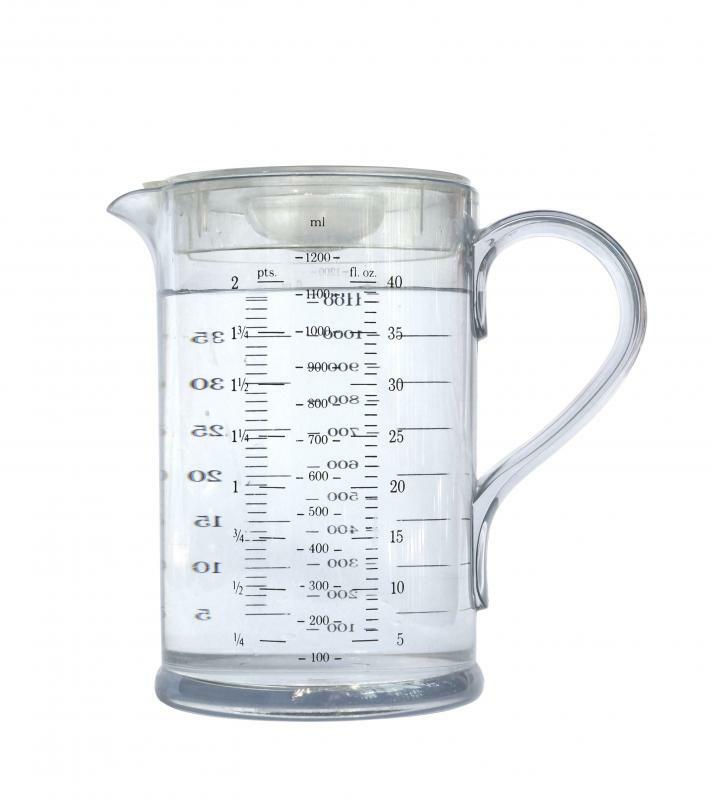 Measuring 1 cup (236.5 ml) of water in a 10 cup (2.36 l) container can lead to inaccurate readings, so cooks should try to use the smallest cups possible. One of the main drawbacks of measuring cups is the number necessary for a complete range of measurements. Cooks must keep at least one complete set of dry cups and another set for liquids. This can require significant storage space, and at least one or two vital cup sizes will often eventually disappear. A modern solution to the storage and shrinkage problem is a universal measuring cup. This kitchen gadget is a two-piece cylinder that acts almost like an open-ended syringe. The outer cylinder contains all the possible gradations of both liquid and dry measurements. A tight-fitting inner cylinder is pulled down to the proper measuring line. The ingredient can then be placed in the container and leveled off. If another ingredient is required, the inner cylinder can be pulled down yet again to add the new measurement. Several dry or liquid ingredients can be added all at once and then dumped as a unit into the mixing bowl or food processor. What are Some Equivalents to Portion Sizes? What Are the Most Important Kitchen Tools? What are Different Types of Measuring Cups? What are Different Types of Oven Mitts? I have a measuring cup I bought from Pampered Chef that is used to measure both dry and liquid ingredients. This comes in handy if you need to measure both liquid and dry ingredients and only want to use one utensil. It also works great for measuring something like peanut butter. You just spoon it in the cup and it slides out much easier than using a traditional measuring cup. @andee-- I haven't been as happy with my silicone measuring cups. I like all the benefits you mentioned, and at first was impressed with them. What I found after using them for awhile though, was that some of my recipes weren't turning out as good as they had in the past. I found out the measurements in the silicone cups were off compared to measuring cups I had been using before. Has anybody else noticed this with using the silicone measuring cups? I had the same measuring cups for many years and decided it was time for an upgrade. I bought some silicone measuring cups which I have been very happy with. They are flexible, but you can put them in the microwave without any problems. They also stack up nicely so they don't take up much room in my drawer. I still have my old plastic measuring cups, but have found that I use the silicone ones for just about everything. 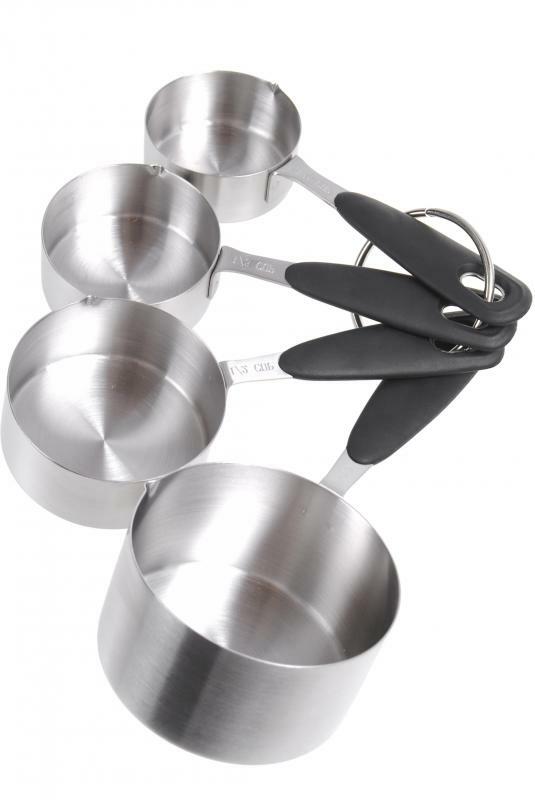 Stainless steel measuring cups sometimes come with a lifetime warranty. Even though you have to pay more for them up front, you will get a lot more usage out of them. I have sets of both standard and odd size measuring cups of this kind. The odd measurements are 1 ½, ¾, and 2/3 cups, while the standard ones are ½, ¼, and 1 cup. I think it's strange that these are sold as different sets. Who wouldn't want all the measurements together? I have both a glass and a plastic liquid measuring cup. I use the glass one for ingredients that need to be heated up or melted, because the glass is tempered and can stand up to heat. Often, recipes will call for melted butter. The easiest way to melt it is to put it in a measuring cup and stick it in the microwave. The plastic measuring cup would not work for this. However, if I just need to measure out a cup of milk or water, I will use the plastic one. That way, I keep the glass one clean and available for using with my hot ingredients. @cloudel – I had some kitchen measuring cups on a ring, but I took them all off of it. I found it to be annoying. I generally only have to use one or two cups per recipe. So, I end up with two dirty cups, while the others are clean. If I don't separate them, then the other cups are likely to get flour or sugar or whatever I used on them, too. Also, when I need to wash the two cups, I don't want to have to wash the whole set. I have a set of measuring cups with matching spoons. They are all made of the same black plastic, and they have the same rounded style. One convenient thing about these cups and spoons is that they have black plastic rings to keep them all together. The cups go on one ring, and the spoons go on the other. The ring functions like a key ring, and it can be pulled apart if I want to remove just one cup or spoon. The ring keeps them from getting scattered all over the place inside the drawer. I agree 100 percent with anon42814. A cup is a cup! "It is important to use the proper measuring cups when dealing with both dry and liquid ingredient lists. A cup of flour is not the same as a cup of vegetable oil..."
This is misleading - a cup is a measure of volume and a cup of flour has the same volume as a cup of oil. The different shape of cup for "liquid" and "dry" is just for the convenience! It is easier to measure and carry the liquids measured in those cups that will not overflow, yet the dry ingredients are easily 'leveled' in those up-to-the-rim cups. I was involved with a furious argument over this, when I used 'one of those liquid cups' to measure flour -- and had to prove that a 'cup is a cup is a cup' by volume!